Last evening, the United States military launched an attack on a Syrian airbase in response to the use of chemical weapons two days ago on the town of Khan Sheikoun. The airstrike killed over five dozen people, including many children. 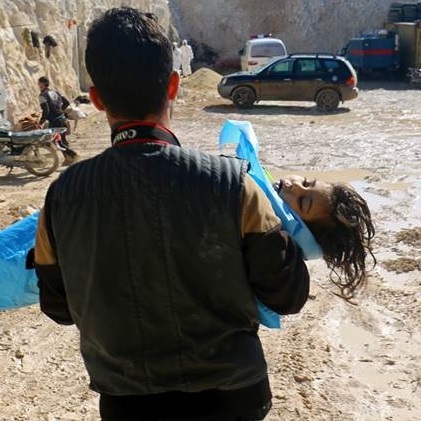 The retaliatory attack targeted the Al Shayrat airbase because it is believed the aircraft that carried out the chemical bombings originated from this location. Yesterday’s act of war does not presumably fall under the 2001 AUMF, since presumably there is no link between the Assad regime and 9/11, but the use of the words “terrorist” and “terrorism” in the 2001 AUMF raise the question of whether yesterday’s act is in fact part of the same war: “the war against terrorism.” Bracket for a moment the troubling question of whether one can declare war against an “-ism,” an abstraction. Bracket for a moment the question of whether there could be any realistic objective, apart from the eschaton, that could bring such a war to a just completion. We have more immediate and pressing questions to answer: what is the real meaning of this word? To what reality does it refer? And how does it in fact function in our society? Like its more Orwellian cousin “extremism,” the term “terrorism” is susceptible to almost limitless manipulation. On the very same day the chemical attacks took place, in fact, The New York Times ran a front-page story on Russia’s crackdown on Jehovah’s witnesses on the grounds that they held and propagated “extremist views.” In our own country, the link between “extremism” and violence is slightly stronger, but the frequent need for the qualification in the frequently-used phrase “violent extremism” reveals that the link is not logically necessary. Hence “extremism” need not always be violent, as the case of the pacifist Jehovah’s witnesses of Russia so aptly displays. Likewise, “terrorism” need not be associated with international ideological organizations. It need not even be motivated by “extreme” beliefs or political goals. If the bombings of Syrian civilians over the past decade teach us anything, it should teach us that the most imminent and lethal perpetrators of terrorism are sovereign nation-states. This fact has always been the case, of course, and it is a wonder that, after the hundreds of millions of deaths for which nation-states were directly responsible in the 20th century, anyone could ever deny it. With Assad’s indiscriminate slaughter of his own people, the original prototype of “terrorism” is beginning to re-emerge. Yet what is distinctive about “terrorism” as a moral act depends upon its differentiation from other kinds of unjust killing. It is not simply intentional killing, but indiscriminate killing carried out publicly for some political purpose. The public and political dimensions set it apart from murder in a general sense, which is often private and motivated by individual ends. Yet if we suppose that terrorism may be carried out by a “legitimate authority,” then what differentiates it from acts of just war can only be one thing: discrimination. For those who hold just war commitments, it matters who one targets with military force and what means one uses to pursue military objectives. Some refer to the latter principle as “proportionality,” but I have in mind not only the prohibition of excessive force, but the prohibition of some weapons or tactics in all circumstances, even if it means one has to retreat or concede defeat. If just war prohibits the targeting of civilians, then one cannot target civilians ever. If just war prohibits chemical or nuclear weapons, then one cannot justify their use ever. These limits become all the clearer in the present context, since should we or our allies violate them the rationale of any “war on terrorism” evaporates. I realize that neither our government nor our society at large are likely to label yesterday’s attack on Syria as part of the “war on terrorism,” but from my perspective any justification of it will amount to the same thing. Assad is indiscriminately killing his own people publicly and for a political end. And what is more, it seems clear that the critical medium for achieving this political end is precisely that which we universally ascribe to terrorists: widespread fear, anxiety and paranoia among the members of a particular community. If Assad’s ongoing attack on his own people does not constitute terrorism, then I don’t know what does. It does not deserve the qualification “state terrorism,” since it is more purely terroristic than any other act or campaign carried out by any of those organizations or persons on any governmental “watch list.” It really is the prototype against which we should determine whether other incidents properly fall under the heading. But all that means that the intelligibility of “terrorism” depends upon our own prior commitment to just war, or at least to the principle of discrimination. If there is no tactic or weapon to which we would not resort in order to win an armed struggle, then we ourselves are nothing but terrorists who have the luxury of choosing what methods of war we find most palatable at any given time. Is there any plausible justification here that, these are dangerous groups—a threat to Syria, a threat to the United States, to the broader world—and the threat might be justification for the kinds of tactics being used? Well, not if you believe in any kind of international humanitarian law or limits on how war is conducted. No matter who you are fighting, it is illegal to use chemical weapons. And the question that the world is facing now is, in an age when there such an extreme fear of Islamic terrorism, is the world willing to accept almost any kind of tactic to defeat those groups? Or even worse, is it willing to tolerate a leader who fights his own people just using the excuse that he is fighting terrorism? Are we really OK with that? Those committed to just war must respond with an emphatic “no,” for what is at stake is not only the deterrence of any future use of chemical weapons or a regime’s direct attack on its own citizens, but the very intelligibility of what differentiates “terrorism” from any other form of public violence carried out for political ends. If we are all “terrorists,” then it really is only about who has the stomach to do whatever it takes to win. Apart from a robust and unwavering commitment to just war—even at the risk of defeat—“terrorism” can mean anything one wants it mean, and so ultimately it means nothing.